Whenever the term ‘hot tub’ comes into mind, one cannot help but picture a lavish lifestyle like the one’s seen in magazines showing people lounging in luxurious bubble baths in five star hotels, or a beautiful couple enjoying an expensive massage in an upscale wellness place. Today, hot tubs are no longer confined to status symbol as more and more people invest on a life of health and comfort. The emergence of cheap hot tubs have opened new doors so that an average person can afford to put in small hot tubs which can also be easy to set up and clean. Soaking in hot tubs is an age old form of past time and relaxation which has not lost its appeal and is in fact promising to be one of modern man’s favorite activities. What to use – hot tub or spa? Hot tubs are said to fall into a different category from spas, but these two terms are usually used interchangeably. To shed a bit of light on the subject, a ‘hot tub’ is typically made out of wood, which is reminiscent of the barrel-shaped tubs for holding hot water used by our ancestors many, many years ago. Its rustic look makes it blend well with nature and is commonly seen in outdoor hot tub models. Wood may also be the preferred structure by people who fancy that vintage feel as well as the charm and simplicity of the countryside. ‘Hot tub’ may also mean a hot water vessel big enough for one or four people to bathe in. ‘Spa’, on the other hand, is used to refer to the ones fashioned out of acrylic or plastic – a durable and low maintenance material that can easily be molded into different sizes and shapes. Some may only know ‘spa’ as that place for facials and massages, but it can also refer to the ones which have special jets installed in them aid physical therapy. And there is the phrase ‘hot tub spa’ which concerns any tub that carries heated water and is also used for therapy or recreation. The best hot tubs now come in various sizes and styles – a wonderful time indeed to be playing around with colors, materials and shapes when you look back to that time when wood was the only option. The creative and adventurous are no longer restricted to a handful of designs and hot tubs today make for fine decors when its well integrated with its surroundings. Gone are the days of breaking down walls, cementing to floors, digging huge holes and all of the costly and time consuming tasks involved in the installation. Thanks to brilliant manufacturers, we now enjoy portable hot tubs which you can conveniently transport and carry anywhere. 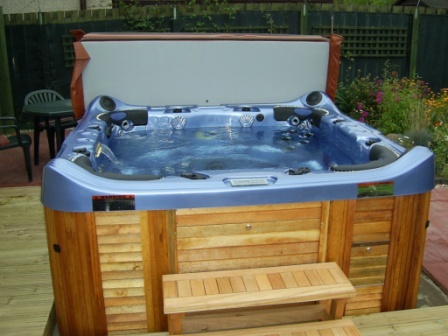 Affordable and inflatable hot tubs have also become popular among families and friends. Technology is also making outdoor enthusiasts and those conscious about their electric bills very happy with tubs heated up through propane tanks. And when you think it cannot get anymore amazing, you can also get a great deal on used hot tubs through select dealers – a great alternative among bargain shoppers who do not mind repairing a few minor scratches. The choices may be overwhelming but information and customer reviews are available online to help you with your purchase. Websites can provide valuable tips to guide you in your next purchase. Just remember to do your research before buying hot tub accessories like hot tub covers for your current model to make sure they match. This entry was posted in hot tub reviews, spa and tagged cheap hot tub, spa. Bookmark the permalink.